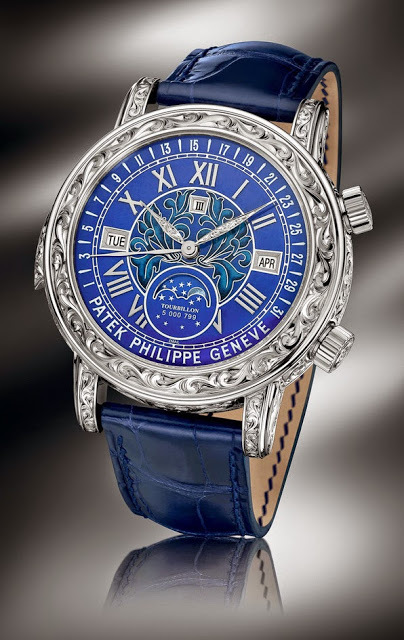 Patek Philippe has just made its most complicated wristwatch even more complicated - the new Sky Moon Tourbillon ref. 6002G is ornately engraved, all over, and fitted with an equally ornate enamel dial. 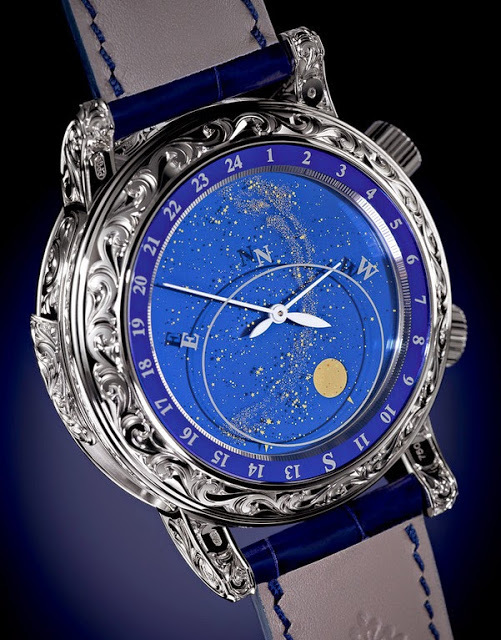 The Sky Moon Tourbillon ref. 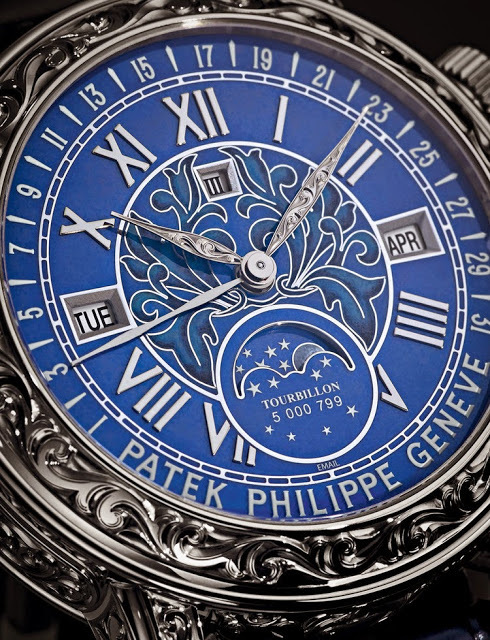 5002 is Patek Philippe’s most complicated watch. Now it has undergone a major facelift. Christened the ref. 6002G, the new Sky Moon Tourbillon in white gold is a timepiece of Baroque sensibility that is heavily subscribed to the much-more-is-much-better school of watch design. 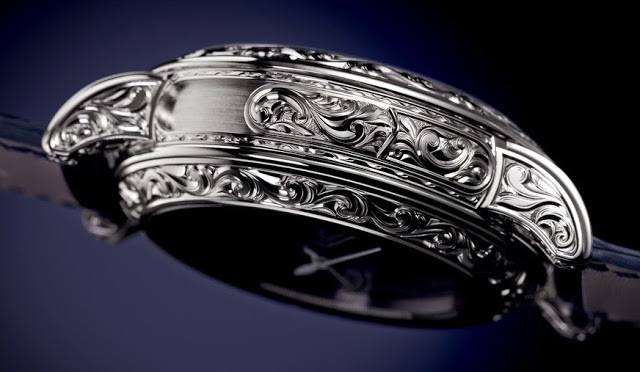 Princes and potentates who find classic Patek Philippe watches too simple will certainly love this. 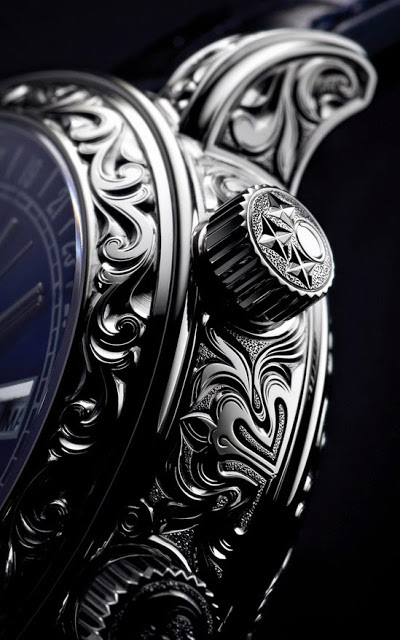 Relief engraved all over – front, back, sides and even on the hands – with a lavish, floral motif, much like that used to decorate high-end hunting rifles, the ref. 6002G is 42.3 mm in diameter. This is many things, but a subtle timepiece it is not. 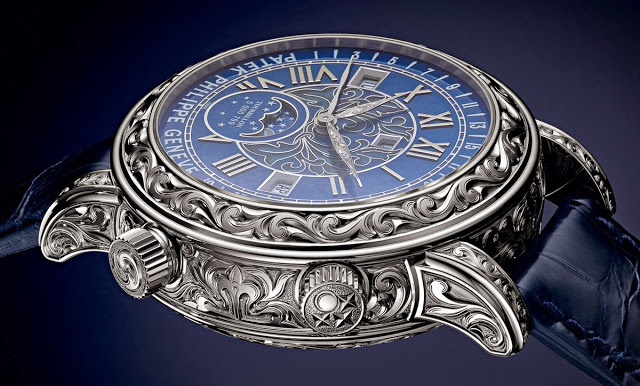 The dial is enamel, with the centre in cloisonné, decorated with what else but an Arabesque decoration, while the outer ring is deep blue champlevé enamel. Mechanically the ref. 6002G is largely similar to its predecessor, the ref. 5002, having both a minute repeater with cathedral gong and tourbillon. In addition, on the front the ref. 6002 has the time as well as a perpetual calendar. And over the the back the display includes the northern sky, sidereal time, and the angular progression and phases of the moon. The key differences with the ref. 5002 are that the ref. 6002G indicates the moon phase rather than the age of the moon, and that it shows the calendar information in windows instead of hands on sub-dials. Inside is the cal. RTO 27 QR SID LU CL, which uses a similar base movement as the ref. 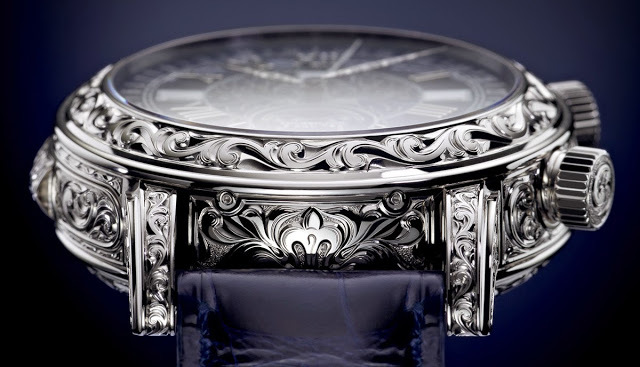 5016 Grand Complication, meaning though it cannot be admired, it is an incredibly beautiful calibre. But much as this is a great technical and artistic achievement, the aesthetic is an acquired taste, much like the recently announced ref. 5004T for Only Watch. Fortunately not many people will need to acquire the taste. The original ref. 5002 retailed for about CHF1.2 million, so this will definitely cost quite a bit more. And like the ref. 5002, only one or two will be made each year.